Jerret Ulmer of HeadAddicts.com and I sauntered into the de.lish Cheesecake Bakery and Cafe in Florissant, Missouri a few weeks ago to see if we could conquer their Inferno Challenge. 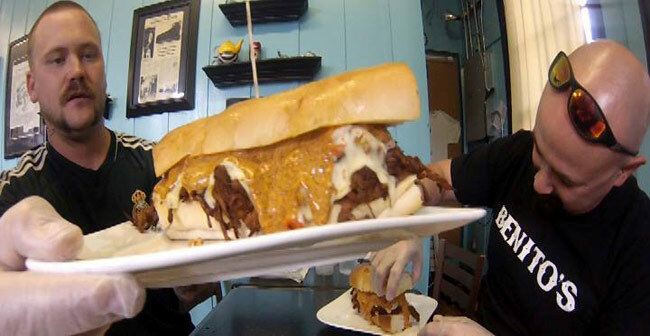 The basics of the Inferno Challenge are this: eat an entire philly cheesesteak-type roast beef sandwich (the meat is cooked with ghost pepper powder, and is topped with pepper cheese, a thick, super-hot chile pepper powder-laden yellow-orange sauce, and liberally doused with large chunks of jolokia and scorpion peppers) within 30 minutes. No food or drinks or drinks are allowed within the first minute of the challenge, but after the 60-second mark water is allowed, as are the potato chips and dill pickle spear provided on the side.